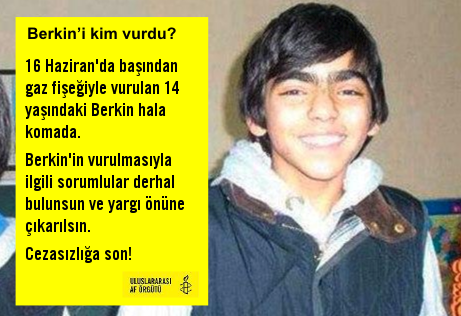 I posted a blog earlier today for the main Amnesty USA site today which gives background on Berkin Elvan and the protests since his death intended for a general audience. This entry was posted in Excessive Force, Freedom of Expression, Turkey and tagged #BerkinElvan, #BerkinElvanÖlümsüzdür, #BerkiniKimVurdu, Amnesty International, criminalization of dissent, Diren Gezi, excessive force, Gezi Park, Human Rights, impunity, taksim square, tear gas, Turkey, water cannon. Bookmark the permalink.